:Teresa.and.Marcus: : Carnitas, Que Rico! I have a friend who moved out of country to pursue higher education. I miss her for many reasons, not least because she is as much of a Mexican food purist and lover as I am. Recently, she said that she had a dream that she was eating my carnitas, and who can resist being able to make someone's dreams come true? So.. we had Mexican potluck for her going away party. I made carnitas, and I promised myself I'd share the recipe with you. Its deliciously Paleo/Primal as well! 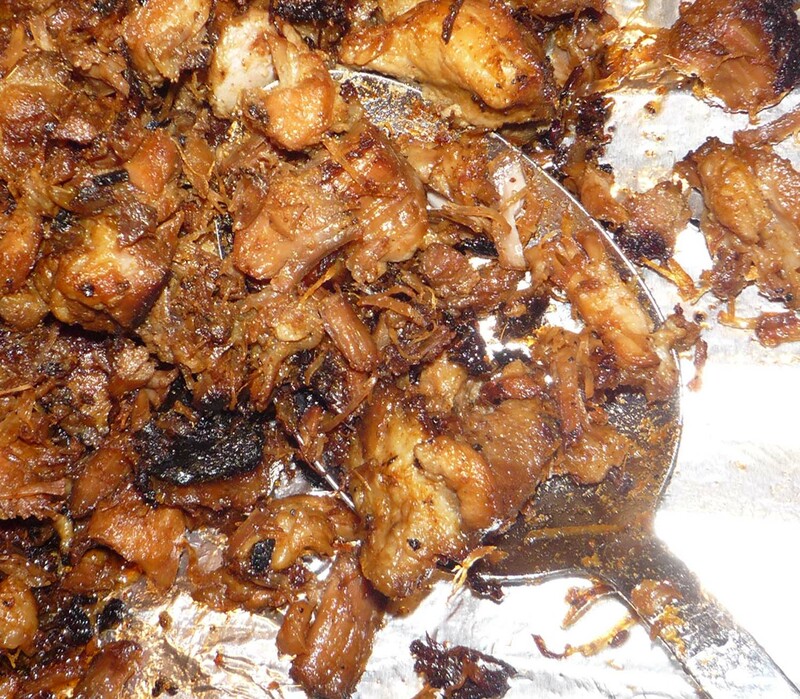 Carnitas is a heavenly Mexican dish which has as many variations as there are regions in Mexico. Meaning "little meats", the pork is cooked with low heat for a long time and then fried in its own fat so it is crispy and caramelized on the outside, and falling apart, melt-in-your-mouth-tender on the inside. First of all, carnitas need time to prepare. Make sure you have a good 4 to 5 hours if you are making a large batch. They don't need a lot of attention until the last hour or so, but I like to put them on and then do things around the house and garden while they simmer. Here's what you will need to feed 2 people with leftovers, or 4 people with nothing but crumbs left over. I always make more than I think I'll need because they are just so good, there are hardly ever leftovers. Feel free to scale upwards as needed. For the party, I started with just under 5kg of meat which happily fed 8 people with enough leftovers for Marcus to have second dinner and for lunches for us both. Cut the pork into one by one by three inches strips. Do not trim any of that delicious fat. Add to a large, heavy bottomed pot or Dutch oven; something that you are going to be ok taking a metal spatula to. Add the spices and rub into meat well. Add the orange juice and then enough water to just cover the pork. Bring to a boil over high heat and then turn the heat right down to almost the lowest setting. You want it barely simmering. Allow to simmer gently, uncovered, for 2 hours (3 if making a double or triple batch). Do something around the house while the pork is simmering, but whatever you do, do not touch the pork during this time. Moving it around will cause the meat to fall apart and you will have pulled pork. While this is also delicious, its not what carnitas are about. After 2 or 3 hours, turn the heat up to medium high, let all that water boil off and the fat to fully render. This will take between another 1/2 to 3/4 of an hour. 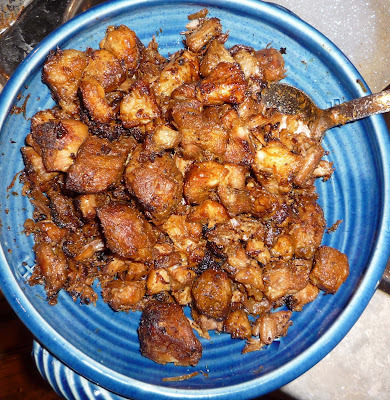 When the liquid is gone, the pork strips will start frying in the rendered fat. Now comes the tricky part. You want to let the pork fry enough that all the outside gets caramelized but not burned, while handling it as little as possible so it doesn't fall apart too much. I've tried 2 different methods to get that crispy outside without making pulled pork or overly blackened bits. If you have a big enough pot, you will be fine to just let the pieces fry on the bottom. You can take half the pork out (keep warm in the oven) and crisp it up in two batches. Turn the pieces with a metal spatula a couple of times, scraping the blackened bits up off the bottom as you turn. At this point, some of the meat is going to shred, but the different sized pieces add texture and flavour. If you have a small pot, you may find that like me, in trying to crisp it, you move the pork around so much that the meat falls apart. I wasn't happy with how much it was shredding, so I pulled the pork out after one or 2 turns, piled it up loosely on a foil wrapped baking sheet, and shoved it under the broiler for a few minutes. It worked like a dream. Piling it up (rather than spreading it into a single layer) created different levels of caramelization and crispiness. In Mexico, carnitas can be served as a dish by themselves or with tortillas or tacos. To keep them Paleo/Primal, use lettuce leaves in place of tortillas. Serve topped with home made salsa verde or roja, cilantro, finely chopped onions, avocado or guacamole, squeezes of lime, and be prepared to be adored by your friends. Very informative! I feel that I could make these bits of deliciousness from your vivid description and instructions.